This research was conducted on a company engaged in food and baverage (ice cream). To meet customers every day the company already has a stockpile warehouse but the documentation that is used today is still simple by recording goods stock by looking directly at the items, and recording in the stock book that has been provided as a report to the leader. In this way there is often a difference between the real stock of goods and the recording of goods per month from the head office. In this company there is also no method to optimize the cost of inventory. This study designs an application that is able to process, document, calculate order transactions and store inventory in warehouses. By applying the Economic Order Quantity (EOQ) method in which the company can find out the amount of good inventory that the company needs as efficiently as possible. It can also be known the inventory of security (safety stock) and the most appropriate time to hold a reorder point (reorder point). With this inventory inventory information system, it is expected that the company can carry out the planning, procurement and monitoring of goods inventory properly, but it can also produce accurate, accurate and effective reports. RUBHIYANTI, Rini; PRATIWI, Intan; FEBRYANTAHANUJI, Febryantahanuji. Penerapan Metode Economic Order Quantity (EOQ) Untuk Persediaan Barang Berbasis Web. JAE (JURNAL AKUNTANSI DAN EKONOMI), [S.l. ], v. 3, n. 2, p. 12-23, sep. 2018. ISSN 2541-0180. 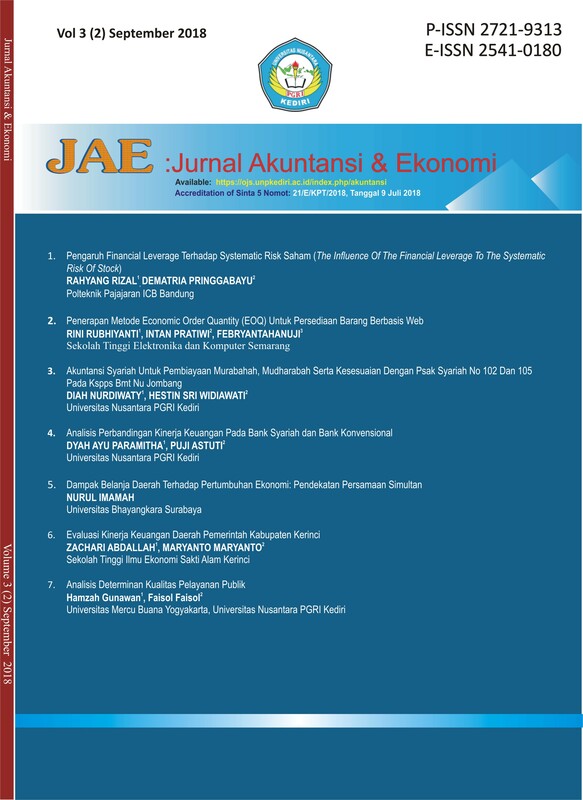 Available at: <http://ojs.unpkediri.ac.id/index.php/akuntansi/article/view/12504>. Date accessed: 24 apr. 2019. doi: https://doi.org/10.29407/jae.v3i2.12504.